Rochester Expo Park. It was for the most part just a 'race track'. (See Rochester Driving Park) I do not know when to include these when they hosted 'other affairs' and 'fairs', etc. 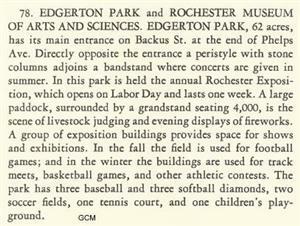 Buildings, places and events associated with the Rochester Industrial Exposition, renamed the Rochester Exposition and Horse Show in 1917, and then called simply the Rochester Exposition from 1934-36. 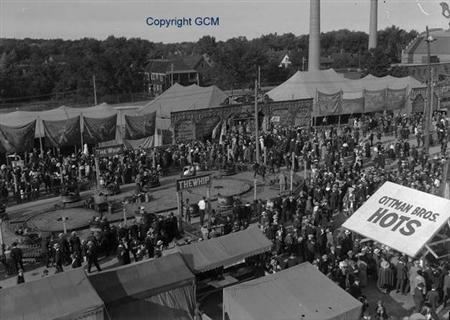 A Chamber of Commerce initiative, it was held annually from 1908-1936 to promote local industry, and featured exhibits, parades, concerts, and later, horse shows. 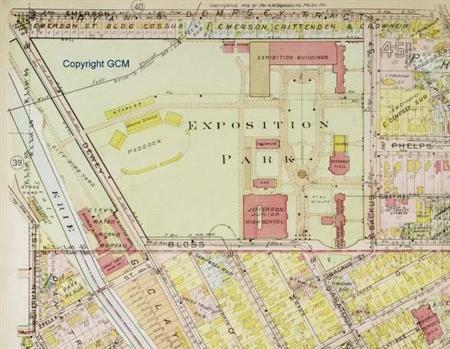 Several views of Exposition Park, (not on this site) renamed Edgerton Park in 1922, are shown. The peristyle entrance of Convention Hall and the Industrial Building are individually featured. Other scenes depict Main Street, showing buildings draped with flags, and the Exposition Parade in progress. City light shows at night are also shown. Some cards feature facts about the city, or captions and illustrations designed to promote Rochester. 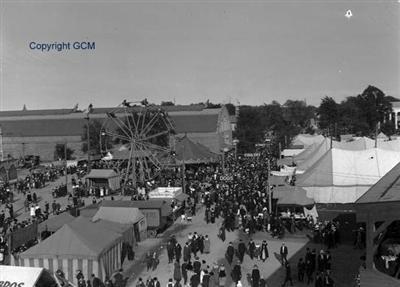 Exposition Park became the site for the Rochester Exposition, an annual Chamber of Commerce event that promoted the city. Many of the old school buildings were permanently used by the Exposition. The chapel became the assembly hall, the drill hall became the exhibition building and the girls’ department building became the library and museum. 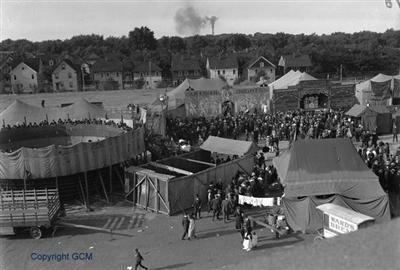 New structures were built on the site as well, including a bandstand, the peristyle, grandstands and Jefferson Junior High School. 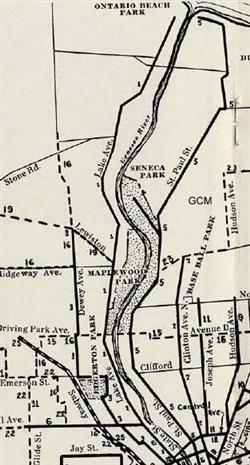 In 1922 the park was renamed Edgerton Park after Rochester mayor Hiram Edgerton. Most of the structures in the park were razed in 1947, as the grounds were no longer used for the expositions. However, some structures, such as Jefferson, remain on the site. The last surviving building from the days of the old State Industrial School, though, is the former chapel building. It is currently (in 2002) the Edgerton Recreation Center at 41 Backus Street.